A bad attitude can keep you down better and longer than any external force. Sadly, so few people take the time to check themselves. Your passion, if not ignored, will take you to your destiny. God can do extraordinary things through ordinary people like you and me. God can do extraordinary things through ordinary people like you and me. He is not looking for “perfect” vessels, but “willing” vessels. Sometimes, He uses the people we least expect to exemplify His greatness in the most awe-inspiring ways. Read about what God has done to an ordinary woman with faults and failures just like everyone else and how He has transformed her existence into an extraordinary one. You can be one of these people. 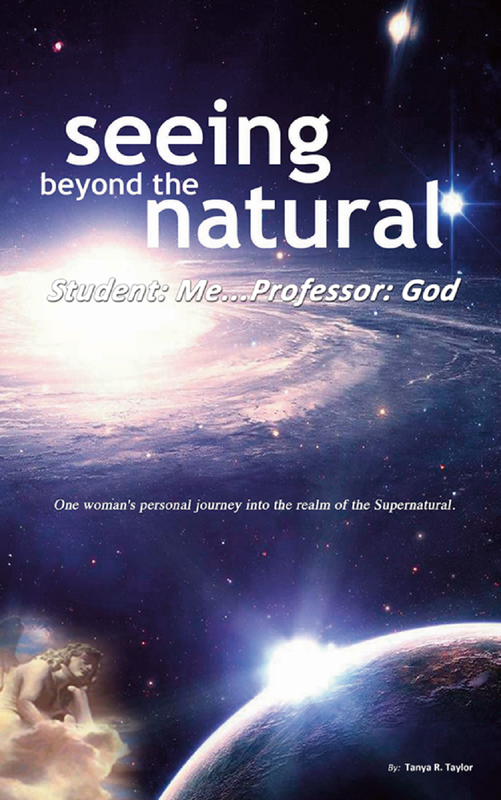 Seeing Beyond the Natural, Student: Me… Professor: God shares insights God has personally taught Tanya that may be uncomfortable for some and revelations that have drastically changed the lives of others. Read about real-life miracles, healings & financial breakthroughs; the mysterious realm. Moreover, this book illuminates the heart of God in such a way that will leave an indelible imprint in the hearts and minds of every single reader. Before reading this book I never realized that I had the mind set that I didn’t deserve God’s favour. I have said it many times and to me I felt my faith was strong but deep down there was doubt. I felt I was not Christian enough or sanctified enough to truly be blessed by God. The name of this book truly is a message from God letting all of us know that no matter how dirty or unworthy we may feel as human beings, God loves us. He loves us in all our imperfections, in all of our mistakes, in all of our sin and iniquities. He loves us because in all of that dirt….He sees a diamond in its rarest form. This book also tuned my eyes and mind to the evil that lurks to devour and destroy us. It has given me the tools I need to fight this evil. This book is truly a gift from God to all who are beaten and down trodden in mind and spirit. It is a message of hope. Look forward to the 2nd book. A beautiful book. It has given me new perceptions. I understand GOD much better now. This book made me think about all the aspects of my life. There is so much love and hold as much wisdom that we can use in our daily lives. This book offers inspiration, light and lots of love. This is really a must and if you dare be honest with yourself this book can change a lot in your life. I wish you all a loving change. This book will give you insight into the significance of miraculous supernatural events that take place in our lives more often than we think. Excellent material that will move you into another realm of wisdom and understanding regarding God’s mercy and grace. Unbelievable Read!!!! This book, if I could call it a book, because I would prefer to call it a blueprint or Manual of the Supernatural, was truly riveting and insightful. I could not put it down. It is an abiding testament of the fact that as we draw nearer to our Creator, He will draw nearer to us and show us great and mighty things. I was amazed by how the author was able to vividly show her journey, step by step, line upon line, and precept upon precept of the depth, height and magnitude of her relationship with our Lord, and at the same time seal these revelations with the Word of God. Some may have a difficult time grasping some events that were mentioned, but as I read through the Manual, I could feel the veracity of what was being conveyed. It caused me to take an introspective look at my walk with my Saviour and desire even more and more of Him. Truly, this Manual would enrich your personal library and would be an asset that causes you to reflect on where you are now and where you want to be in your walk with our Creator. First of all, I believe beyond a natural doubt that nothing happens by chance when it comes to Spiritual things of the kingdom. I stumbled into this book while using my daughters kindle fire and VERY glad I did! The author gives a very detailed account on supernatural experiences that points and gives God ALL THE GLORY! I was consumed by the accounts shared and could not put the book down. I would have paid a lot for this book because it was heartfelt and engaging. At least 80% of this book confirmed and mirrored my life experiences to the T. I wept, smiled and raised my hands in awe being blessed by “Seeing beyond the Natural”. For those who embrace the moving of the comforter in their life, there is no words I can add to this testimony but “priceless and comforting”. This book brought a sincere joyful revival into my spirit as the Spirit touched me through this author. This life account covers a variety of experiences that describes like minded believers who God has been close to. Expect to receive encouragement and some wisdom if you have been there and thought you were somewhat of a odd one! Well, your not alone and as I read continuously I was so emotionally drawn in that it felt it was meant to be that I crossed path with this book for such a time as this. I believe Mrs. Tanya R. Brown (Taylor) and respect her for it. Wondering if you have written more books?? If she has not “please do” the anointing was spectacular and thank you so much for putting a new spring in my heart. For those who take the things of God seriously and those curious to know get the book but you need to be open minded and not be critical because you have not experienced the move of the Spirit just “yet”. These testimonies are much needed because they empower you as long as you keep your eyes on Him giving Him All the glory! “Seeing Beyond The Natural by Tanya Taylor was a fantastic Book, certainly worth the wait for a copy. I must say this Book captured my attention from start to finish. A few years ago I read another Book written by the Author but with this Book, I can truly say she has definitely out done herself. I too have what family members and a few friends call “weird” and “strange” occurrences. “Through reading this Book I have learnt that I am not “weird”, a “freak” or “strange”, I was made to understand that I am in alignment “with the spiritual realm in such an awesome way” and that “some people who haven’t had these experiences can’t seem to wrap their heads around it, but as a person who often experience these things I know they’re true and no one can tell me any different”.